23 October 2014. Inocucor Technologies Inc. and McGill University are collaborating on development of new types of microbes that improve soil for greater yields of large-scale crops such as corn and soybeans. Financial details of the research and licensing agreement between the company and university, both in Montreal, Quebec, Canada, were not disclosed. Inocucor Technologies produces soil enhancement products based on microbial consortia, communities of engineered microbes, similar to bacteria or yeast, designed to produce desired outcomes in their environments. The company’s technology, invented by its founders Maggie Bywater-Ekegärd and Ananda Fitzsimmons, produces microbes with a fermentation process that boost the soil’s ability to stimulate the crop’s seed, plant, and root system. The engineered microbes send and receive biochemical signals with plant cells to achieve these results. Bywater-Ekegärd and Fitzsimmons continue as vice presidents of Inocucor. In the deal with McGill University, Inocucor engages the lab of plant biologist Donald Smith who earlier carried out sponsored field trials of the company’s current Garden Solution soil enhancement product. Smith’s research interests include studies of rhizobacteria that increase the growth and yield of many crops. Garden Solution is designed to accelerate maturation and increase yields of vegetable and fruit crops. The collaboration with McGill aims to produce a new type of microbial product more applicable to large-scale agricultural crops including wheat, corn, canola, and soybeans. 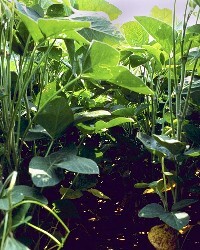 Trials conducted by Smith at McGill include tests of the company’s current formulation with soybeans and corn.